Arco, the UK’s leading safety company, has moved its digital team to the @TheDock development in Hull’s Fruit Market to be at the heart of the city’s tech community. The move is part of Arco’s biggest-ever change programme and is aimed at accelerating the company’s digital development and ensuring its continuing success. 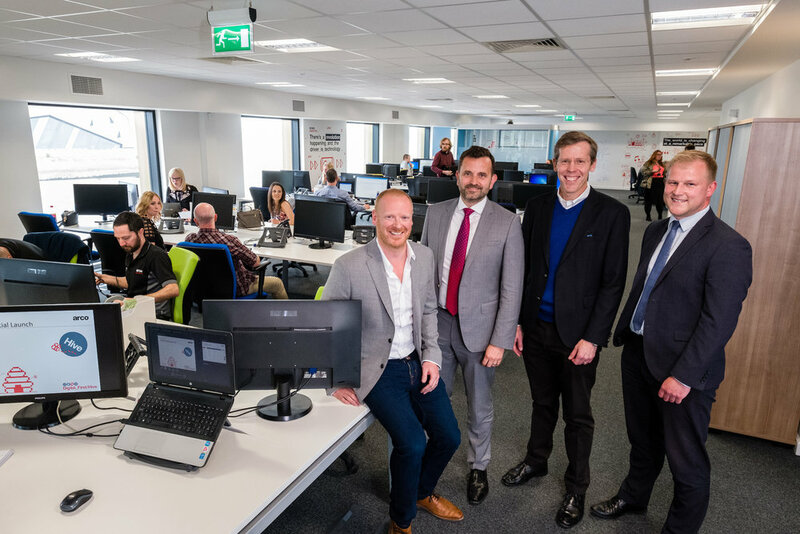 The new office is leased from Hull-based regeneration company Wykeland Group and will house the 50-plus strong digital team as well as up to 20 consultants and partners working on Arco’s “Digital First” transformation programme. Some of the team have transferred from Arco’s headquarters in Waverley Street, Hull, with others newly hired as part of ongoing recruitment that will add 30 new jobs in digital disciplines such as software development, search engine optimisation, online analytics and systems architecture. Arco has chosen the 4,000 sq ft first floor offices at the £15m @TheDock development to benefit from being part of Hull’s most exciting new business quarter, which has the Centre for Digital Innovation (C4DI) tech hub as its centrepiece. The office overlooks the Stage @TheDock amphitheatre created by Wykeland within the historic former Central Dry Dock and has great views of The Deep tourist attraction and Humber estuary. Arco’s Digital First programme began in January and will run over the next three to five years, with the company investing more than £30m in the transformation. More than 150 Arco staff are working on projects as part of the programme. Richard Martin, Arco’s Digital Director, who is leading the programme, said choosing @TheDock opened up opportunities for collaboration and made the business more attractive when competing for tech talent. The office is open plan, with informal breakout spaces rather than meeting rooms. Arco staff based elsewhere are encouraged to plug in their laptops and work from the office to promote the sharing of ideas and company-wide contributions to the change programme. Mr Martin said: “The working environment has been purpose-designed to promote collaboration, creativity and pace of change. Family-owned Arco was founded in Hull 133 years ago and employs 1,700 people across the UK, including more than 800 in its home city. The company offers more than 170,000 personal protection equipment, workwear, safety footwear and workplace safety products. The digital drive will involve a complete rebuild of the Arco website – www.arco.co.uk – to lift online sales from 40% currently to over 60%. Mr Martin, who is a fourth generation member of the founding family, said Arco had been a corporate member of C4DI for some time. He added: “We now want to strengthen our links with the local digital community and tap into specialist skills within C4DI. Being based here means we are perfectly placed to do that. “We’re pleased to have worked with Wykeland, as it is a forward-thinking company that creates great places to work. We’re both local businesses committed to the economic development of the city and the region and to investing in the local community. “We’re excited about being located in the Fruit Market, which is at the heart of Hull’s regeneration and cultural renaissance. Mr Martin stressed Arco remained committed to its headquarters in Hull, which would undergo a significant refurbishment over the next two to three years as part of the company’s drive to be a great place to work. Dominic Gibbons, Managing Director of Wykeland, said Arco was the latest blue chip business to recognise the exciting opportunities offered by Hull’s fastest-growing business location, following the recent announcement that global technology company Saab is taking an office at C4DI. Mr Gibbons said: “Arco is a pillar of Hull’s business community with a proud heritage in the city and exciting plans for growth, driven by a digital-led transformation. We’re delighted Arco has chosen @TheDock as the base for that change programme. Further opportunities are available at @TheDock, with Wykeland marketing a 3,100 sq ft ground floor restaurant and 4,000 sq ft of offices on the second floor, which can be sub-divided as required. Mr Gibbons added: “We have a great deal of interest in the remaining @TheDock opportunities and, as part of our joint venture with Beal Homes, commercial units are available in and around Humber Street in the heart of the Fruit Market.